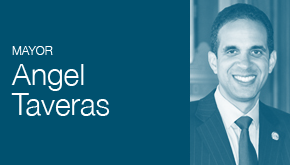 On Tuesday, January 29 at 5:30pm, Providence Mayor Angel Taveras will deliver his 2013 State of the City address. The address will be officially delivered to the Providence City Council in the Council Chamber on the third floor of Providence City Hall. Mayor Taveras’ 2013 State of the City address will be streamed on the City’s website at providenceri.com. On Twitter, follow #PVDsotc for live updates during the speech.